In my last post I blogged about some oyster shooters that I made for a party on the weekend. The Birthday Boy is a lovely bloke and I wanted to make something a bit different for the party. 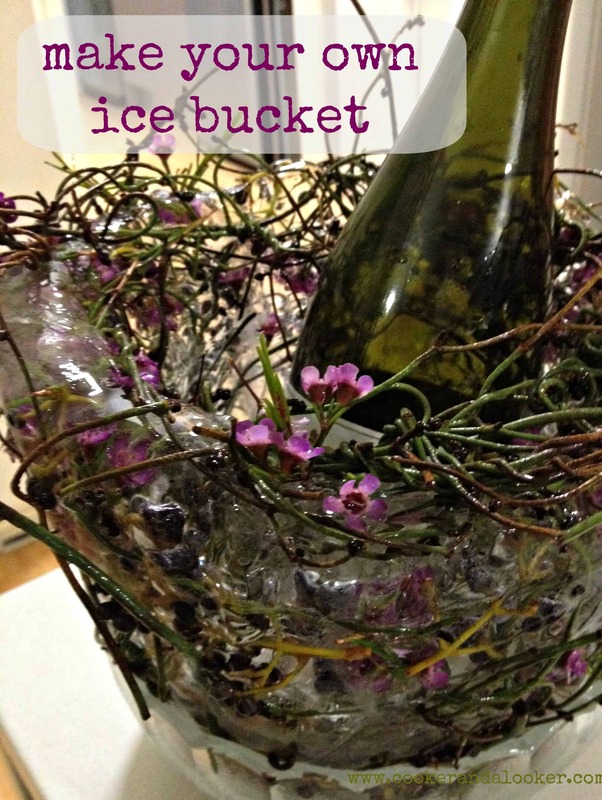 I’ve seen a photo of a homemade ice bucket on Pinterest, and I thought I’d have a crack at recreating it as a centrepiece. First I sought the advice of the very clever ladies at Suncoast Flowers. I told them what I was trying to achieve and they sent me away with some good advice and an armful of flowers, berries and vegetation (which I believe those in the know call greenery). I chose Dodda vine, Geraldton Wax flowers and Privet berries. Lauren was quick to point out that Privet is a pest, so I should bin the remains once I was finished with it. Step 1 – Place something in the base of the bucket to hold the insert off the bottom. Step 2 – Choose an insert that will form the hole that the wine bottle fits into – I used one of the Little Sister’s formula tins. Add a weight (like a rock or some sand) to make sure the insert wont float once you’ve filled your bucket with water. Step 3 – Arrange your flowers/berries/greenery in layers in the space between the insert and the bucket. Step 4 – Fill the bucket with water and freeze. Step 5 – Fill the insert with hot water and run warm water around the outside of the bucket to loosen the bucket from the ice bucket inside. Step 6 – Place your spectacular ice creation on the table (with a plate underneath it to catch the drips as it melts). I was rapt with how well this turned out. It was a beautiful centre piece for the table. Give it a burl for your next party! PS. Suncoast Flowers are on facebook – check out their page here. What did you use to “catch” the melting ice as the evening progressed? I have made DIY ice buckets in the past but have not been able to find or come up with an equally stunning water catcher. Hi Janet, I’ve got some lovely cut glass bowls that I inherited from my grandmother. I find they blend into the ice and don’t stand out too much. Might be worth checking a local op-shop?